This composite image of the nearby galaxy M82 shows Chandra X-ray Observatory data in blue, optical data from the Hubble Space Telescope in green and orange, and infrared data from the Spitzer Space Telescope in red. The pullout is a Chandra image that shows the central region of the galaxy that contains two bright X-ray sources thought to be mid-sized black holes. A pair of rare medium-sized black holes was spotted near thecenter of a nearby galaxy, but for some reason they haven't been swallowed upby the supermassive black hole lurking there. Scientists aren't sure how long these black holes willescape their larger cousin's clutches of death. For now, the dark duo providesmore support to the controversial idea of goldilocks-likeblack holes that are neither very small nor very large. 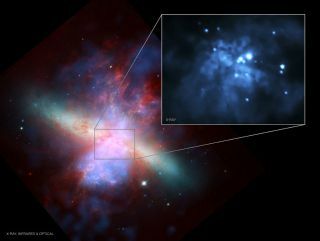 Astronomers discovered signs of the double-trouble blackholes inside the galaxy M82, located about 12 million light-years from Earth,where one light-year is the distance light will travel in a year, or about 6trillion miles, or 10 trillion kilometers. The observations came from two X-rayspace telescopes ? NASA's ChandraObservatory and the European Space Agency's XMM-Newton. "This is the first time that good evidence for twomid-sized black holes has been found in one galaxy," said Hua Feng ofChina's Tsinghua University, who is lead author of two scientific papersdescribing the results. "Their location near the center of the galaxymight provide clues about the origin of the Universe's largest black holes ? supermassiveblack holes found in the centers of most galaxies." For several decades, scientists have had strong evidence fortwo distinct classes of black hole: those with about as much mass as a star ?roughly ten times that of the sun ? and very large supermassive black holes, whichare often located at the center of galaxies and range from hundreds ofthousands to billions of solar masses. But finding black holes whose weight falls in between thosecategories has been much more difficult. Some researchers think these intermediate-massblack holes might form in star clusters and sink toward the center of galaxies,where they would eventually clump together to build supermassive black holes. "We can't say whether this process actually occurred inM82, but we do know that both of these possible mid-sized black holes arelocated in or near star clusters," said co-researcher Phil Kaaret from theUniversity of Iowa. "Also, M82 is the nearest place to us where theconditions are similar to those in the early Universe, with lots of starsforming." Even the existence of black holes in this in-betweenweight category is not agreed upon by astronomers. "This result is one of the strongest pieces of evidenceto date for the existence of an intermediate-mass black hole," Feng said. "This looks just like well-studied examples of stellar-mass black holes,except for being more than 20 times as massive." The two papers describing these results were recently publishedin The Astrophysical Journal.